When you think of crepes, you typically think of the sweeter side of life. The quintessential crepe is fruit filled and topped with powdered sugar. This past weekend, however, we paid a visit to The Crepe Club and savored the savory. Arizona State University alums Karim, Fares, and Omar Tarabichi started The Crepe Club as a food cart on the ASU Tempe campus two years ago. The crepes were so popular they soon had two carts and now have a few restaurants under their belt. They are also behind the amazing Delice Bistro in Tempe. When we visited we wanted to try more than just a traditional, sweet crepe. Additionally, we wanted to try some of The Crepe Club’s other non-crepe items. We selected a variety of savory entrees and weren’t disappointed by any of them! Of course, we had to start with crepes. We suggest that while everything is fantastic, you should definitely try a crepe on your first visit. 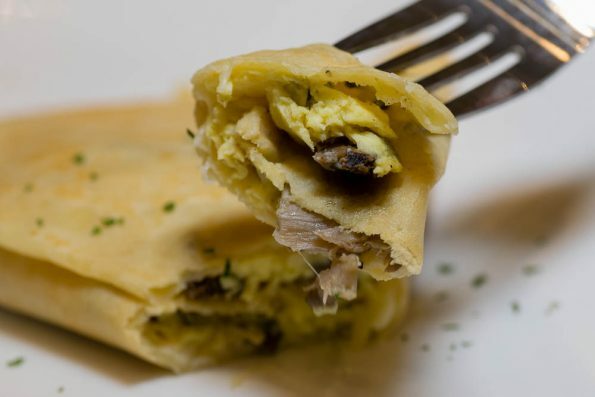 We tried the Mushroom, Egg, and Swiss Crepe and the Apple and Brie Crepe. The crepes at The Crepe Club are offered in 2 sizes: regular and mini. We had both of our crepes in the mini size. This is a great way to share a few without being too stuffed. Both crepes were delicious! We may never eat a sweet crepe again. Both were loaded with delicious filling but weren’t overly stuffed to the point of losing structural integrity. 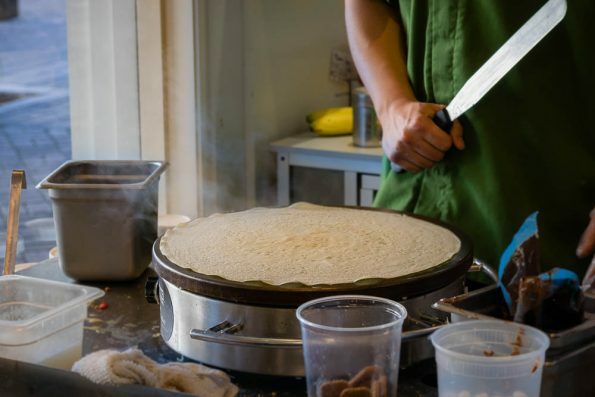 The recipe for the crepes at The Crepe Club come from the Tarabichi’s favorite creperie in Paris – a small kiosk on the famed Boulevard Saint Germain. The family reached out to the owners to share the recipe and it has been modified slightly for the Phoenix restaurant. Next up on our savory lunch visit was the Smoked Salmon Quiche. The Smoked Salmon Quiche comes loaded with gruyere, mozzarella, smoked salmon, red onions, and chives. The quiche was perfect for so many reasons. The crust was delightfully light and flaky, yet it had some crunch and was definitely full of buttery flavor. The filling of the quiche was rich, moist, and also full of wonderful smoked salmon. 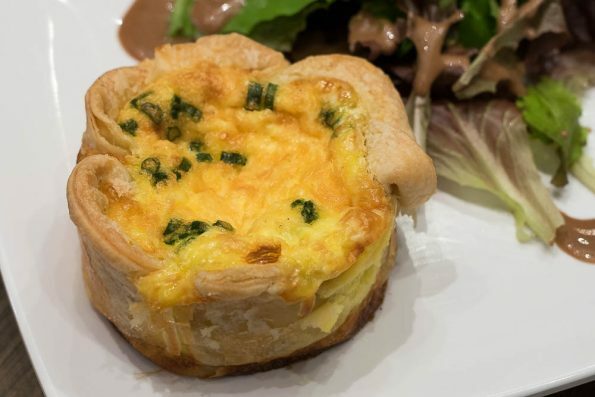 There was no lacking of flavor in this adorable quiche. The quiche was served with a small side salad. This may not sound very exciting given the delicious nature of the quiche. However, the salad dressing (a creamy balsamic dressing) was so wonderful and we wolfed down all of the salad in addition to all of the other things we tried. Do not skip the salad! It pairs perfectly with the quiches and sandwiches. The last thing we tried at The Crepe Club was their Brie Baguette. This sandwich is nothing super fancy, but rather is exceptional in its simplicity. 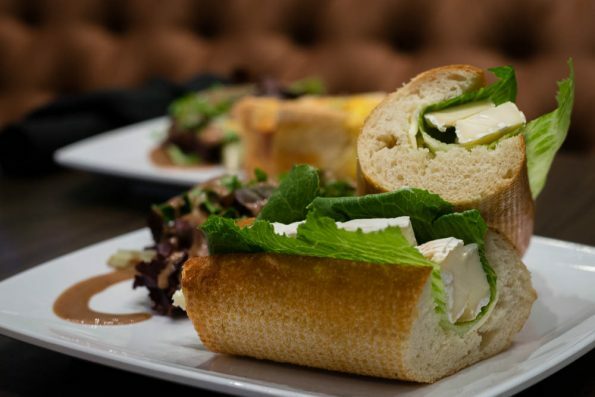 It is comprised of brie, lettuce, and butter, all on a baguette. You might find yourself thinking that butter and brie would be overly rich. This is definitely not the case. They compliment each other spectacularly. This sandwich is what we’d imagine French comfort food to be. The baguette had that perfect balance of chewy crust and soft bread. There was also no skimping on the brie in this sandwich (it felt like we ate our weight in brie during this meal). We really enjoyed our meal at The Crepe Club. The restaurant definitely has that Parisian bistro feel to it. Overall, it had a very happy vibe. We will definitely be back and maybe we’ll even try some of their sweeter options. In the meantime, we’re going to go back to dreaming about that Brie Baguette! Have you eaten at The Crepe Club? What was your favorite menu item? We’d love to hear about it! Leave your comments below or use the hashtag #GeekEats.